Have you ever had one of those days where you are so tired that your entire body feels like it was hit by a train? This week has been a string of those days. In fact, as I was taking these pictures after work, I think I was pretty much on the brink of dozing off. So, it's very fitting that I took these pictures at a train station and railroad museum. Originally I just liked the exterior of the building with its pale yellow walls, but as I am writing this I can't help but to notice the thematic connection with my opening sentence for today's post! While I might be buggin' out about how exhausted I am, I am also buggin' out in a more positive sense over this new short-sleeved sweatshirt with jewel-encrusted bugs. When it first arrived in the mail I thought that it was a little small upon taking it out of the box, but I actually like the more fitted feel as opposed to a big baggy sweatshirt feel, which can often look too casual. I was relieved upon trying it on and being content with the fit that my sweatshirt was one less thing in my life to bug out about! Below are some bug-themed items for spring, which include everything from bees that seem to be buzzing around everywhere this season, especially in Kate Spade's spring line, to dragonflies and flowers. I love how your play on colors - always! I love the stripes too! That sweater is adorable! I'm liking this buggy trend. 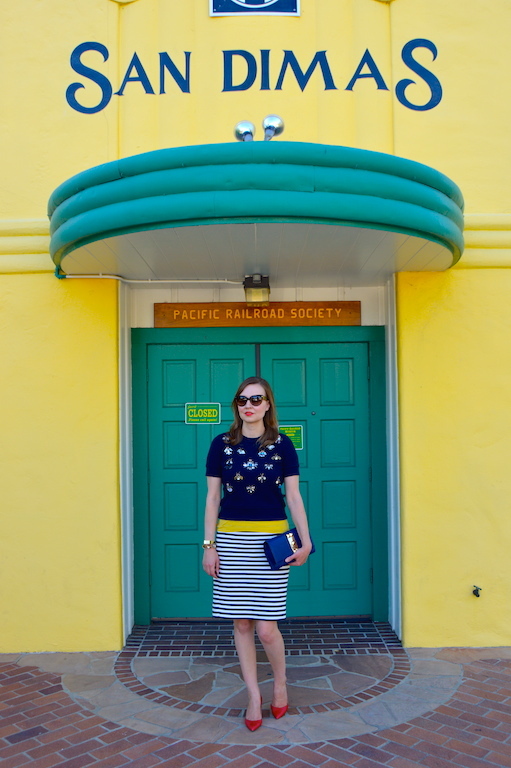 It looks fantastic paired with the striped skirt and I absolutely love the walls of this railroad museum! That mix of yellow and green walls is so perfect! You cannot even tell that you're exhausted because you look absolutely gorgeous!! Love the color mix pretty lady!! Yep, I sure have had those days!! You look gorgeous though--that sweater is so fun, I love it with the stripes. And those "bee" happy loafers you picked---those are just too cute. The recent windy days have caused a havoc on my allergies and I have been struggling this whole week. I rarely buy sweatshirts because I am usually not a fan of the cut. This one is so cute and it fits so well without being boxy and oversized. Oh, I have weeks that are just exhausting, too! I hope you get some rest this weekend! 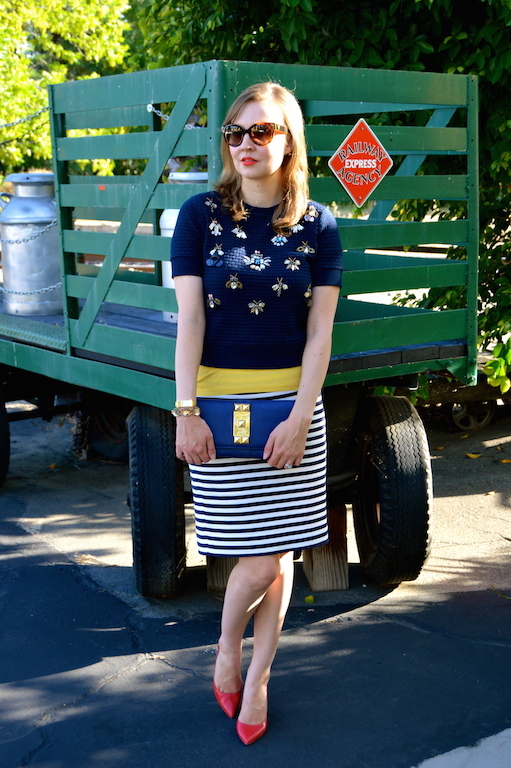 I love the patterns, color and the embellishments in this outfit- so pretty! Love this! I own this top too, and I like to see different ways to wear it. I just did a post too on jeweled bugs! What a super fun look! Love the bling! Wow, I wish I looked that good after a tough week! You look stunning, Katie! 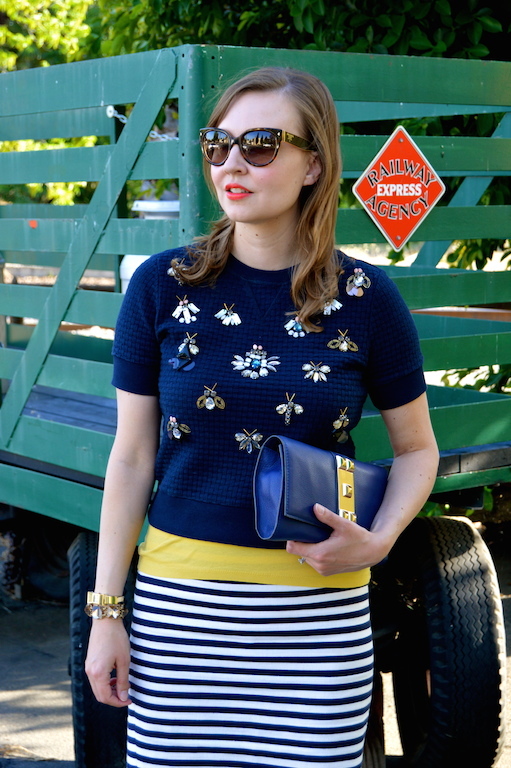 Thanks so much for linking up with Fun Fashion Friday and have a fab weekend! Absolutely loved your sweater... it just sold out ! Gorgeous embellished top! 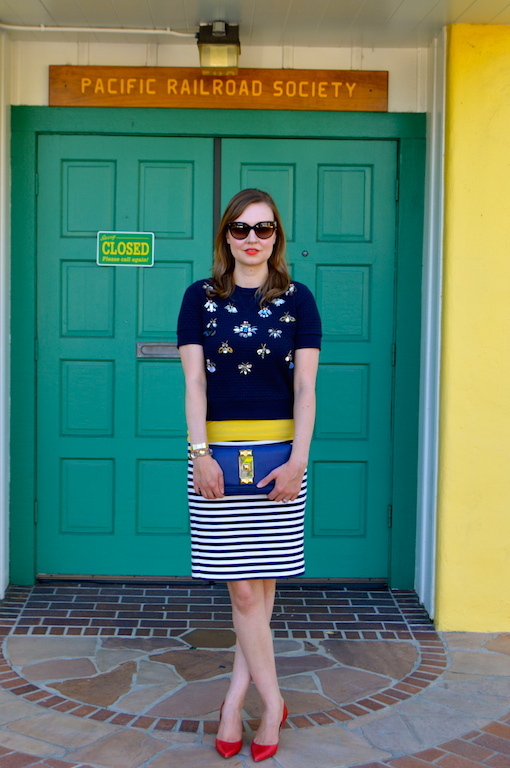 It really looks so great with the pop of yellow and striped skirt. I really enjoyed seeing your fun selections of bug themed items. The Be Happy flats are too cute! I love this outfit! 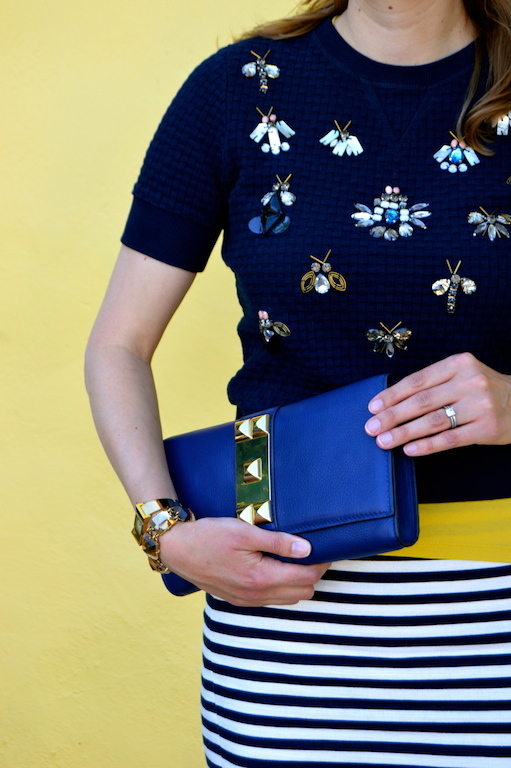 You balanced some sparkle with some stripes and the color combo is on-point.